I dunno if I have bad terminal settings or what, but 1, 2, 4, 7 and 8 all respond with "INPUT NOT ACCEPTED; RE-ENTER:". The other numbers wait for four digits (it still won't accept 1, 2, 4, 7, and 8) before giving me the same thing. I can't remember where exactly, but there's another Iowa Telecom exchange with that same old AIS that has the exact same issue. So when I did a search and found this, I just sorta assumed at the time it was broken or something. 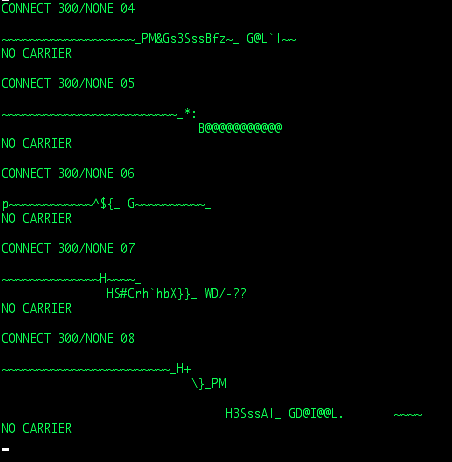 Taking ThoughtPhreaker's advice to scan the Bremen 537 prefix, here are some random modems, albeit probably just faxes. I haven't tried to terminal into these. Nice work! I was actually using Hyper Terminal myself. I think the AIS took issue with the cheap Connexant softmodem I was using. I tried it again on a USR Courier with Minicom, and it works fine. Here's another one, by the way; 319-444-1244. This one has way more changed number intercept entries and non-working numbers get sent to it by default, so I was expecting to hear a lot more of these. The few I tried all went to some generic non-working number recording on it, though. There is a way in the original AIS MF protocol to tell it to not look up a number though, and just tell the caller it's disconnected. Chances are, the switch is just sending that. The SXS table is blank as well. The AIS is old enough (there's a recording on Phonetrips of a switch being installed with one of these in 1987. Odds are good it's still there, and neither the code for ANAC or the EDRAM recordings have changed) that it was probably a selling point for these to be able to talk to a common control step by step switch in some way, since tiny independent companies loved them. So that might be what that is. Since this is the some numbers thread though, here's a numbers. 800-255-0040 - "Welcome to the Amhest ANI check. Please enter your passcode." 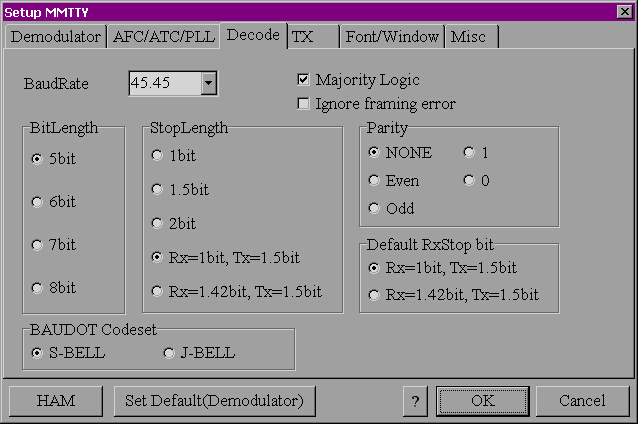 Would you mind telling us the settings to let MMTTY decode TDD data/tones? I've been trying to access TDD numbers using HyperTerminal for example and it doesn't work. I guess since these "modem" sounds didn't connect in TBA I should have expected the same on a terminal. Oh well, I'll return if I do discover anything worthwhile. You will need to convert them to 11025Hz 16-bit mono PCM if you want to open them directly using MMTTY. IIRC Hyperterminal can not generate and interpret Baudot TTY so it can't be used for TDD unless they are using 8N1 ANSI format. 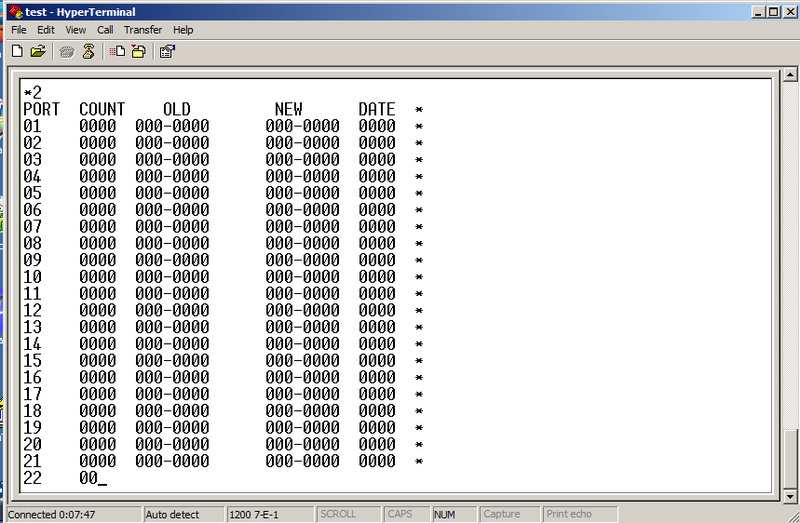 Several years ago I found a program that can run Baudot with a standard modem but I forget what it was called. If you call your local 711 with Hypertermanal and your computer ignores the TDD chirps but answers the carrier tone, you're using ANSI. Odd, it's still garbled text. Would you mind making a screenshot of MMTTY in action? I followed all the steps correctly and (look at the screenshot). I called 711. 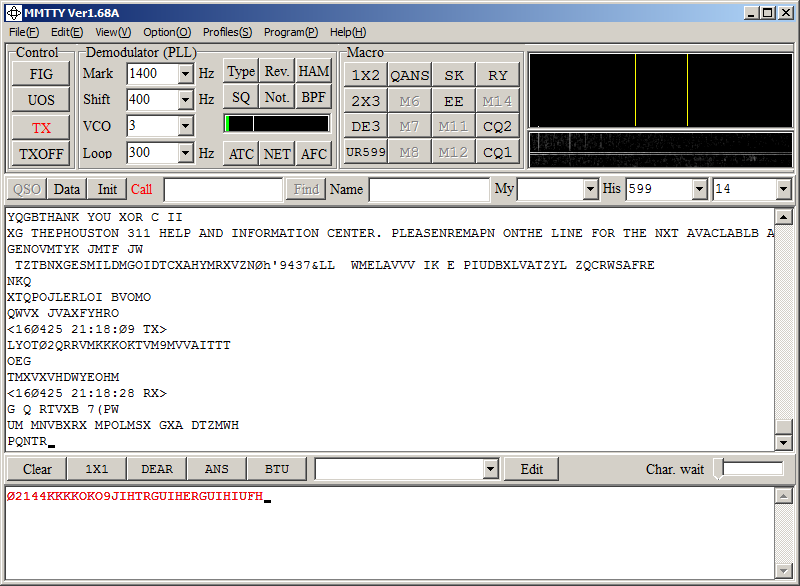 But when I call 713 837 0311 (it's city information for Houston), it decodes it somewhat successfully. What kind of setup are you using to interface to the fone line, do you have some sort of acoustic coupler thing connected to your microphone input/headhone output or do you have one of those type of modems that can be wired directly to the sound card? Decoding. The garbage before REDIAL is it interpreting Pat Fleet's talking. Here's an example of dialing 311. Also, it's an in-line coupler attached directly to my computer. Looks like all of those except for 5130 are faxes. Unfortunately, the hotel that owns 5130 had the bright idea of moving to some transcoded voip connection. Expect some pretty patchy connectivity. Try listening to 217-234-9902; notice how after the 2100 hertz tone, the rest of the handshake sounds significantly different from a fax. And then there's this: 206-312-0000. Thanks for the reply, I did want to say that TBA made a successful found carrier to 770-537-5257 yet once again no terminal software I used detected that number as a carrier. 3714 - Cognitronics rec, "We're sorry, the party is not accepting your call at this time." 5275 - Cognitronics rec, "We're sorry, the party is not accepting your call at this time." 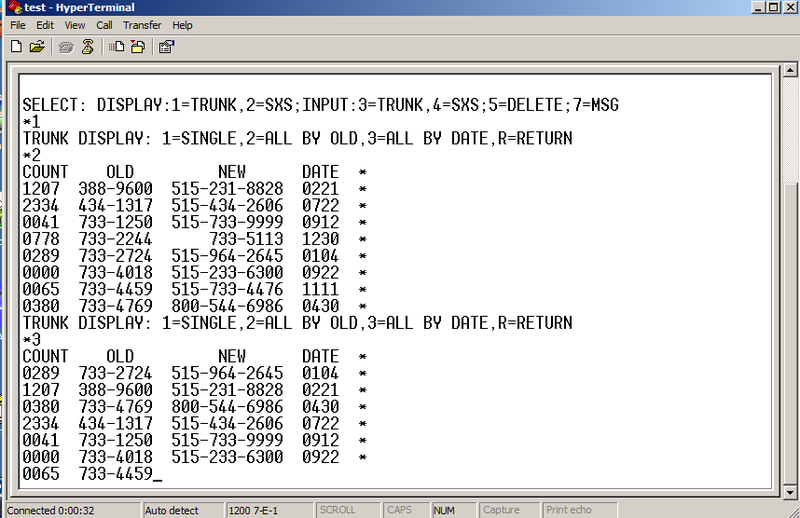 Also, 832-553-9187 picks up with some sort of modulated beep. Anybody know what this is? Also, it's an in-line coupler attached directly to my computer. Is it an inter box or one of those inductive pickup things that you clip onto the cord? If its the latter then it could be the problem (not getting a high enough signal level to properly decode and it's getting lost in the sound card's self-noise). 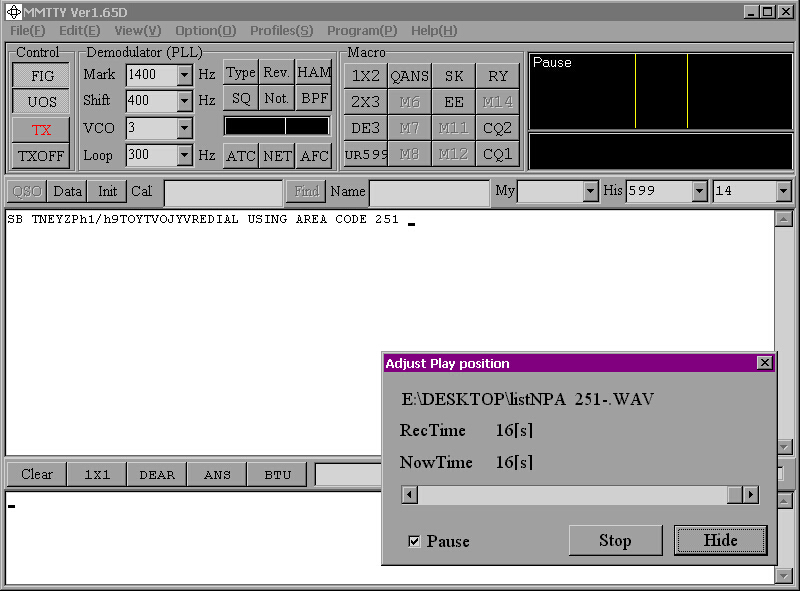 Could also be your sound card's timing is weird and causing decode errors, you can go into IIRC "Misc" in the configuration and set it to a lower or higher sampling frequency if you need to. I have actually thought of trying it through a network of inter boxes i.e. one on the headphone out (transmitting) and the microphone (receiving) with the two connected together on Ma Bell's end. I have not actualy implemented it yet on this sound card (previously only through a laptop) and have no idea what sort of feedback loop it would generate. I suppose in the best case it would echo what I send in the receive area, serving as a local loopback of sorts. 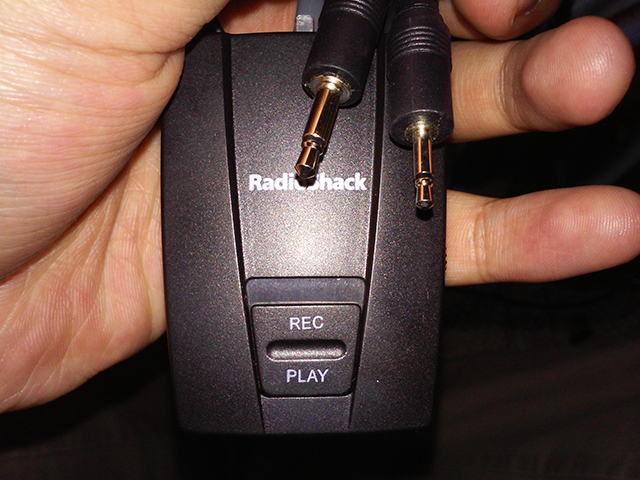 scratchytcarrier: It's this thing I got from Radioshack. Yeah those are the inter boxes I use too. Strange though that it's having that much trouble decoding. Is there much hum or buzz when you monitor it on headphones? because these units are notorious for picking up noise inductively from nearby electronics or electrical lines. Especially when the SINGLE/MULTI switch is on MULTI. I have also found them to give a slightly higher signal-noise ratio by connecting the phone line to the "Telephone" socket on top then connect the telephone to its cord. Not sure why it would make a difference (maybe my own cord is of higher quality?) but it seems to. MMTTY seems to be pretty fussy about noise and will attempt to decode _everything_ it hears as text, even computer self-noise. So today I decided to take a poke at the 5ESS in Denver's main Centurylink building. As per usual with ex-US West switches, plenty of recordings, but some towards the end are particularly hair raising. I dunno if that makes up for the effort of transcribing word for word all these long-winded queue recordings for state agencies . 0004 - 105-type lookalike, doesn't respond to touchtones? 0021 - Ringout to UM VMB, "Hi, you've reached the Denver Main 5E switch. For assistance with the 5E switch or DMS, please call Greg Feeny at 303-624-0374. Or if you need DS0/DS1 assistance, please call 303-624-1954. Please do not leave any messages on this line. Thank you for calling Qwest." 0043 - rec, <weird beeping in background> "You've reached the Denver Main DS oh"
0045 - rec, "Thank you for calling Citycare. All of our lines are currently busy. If this is an emergency, hang up and call 436-5090. Otherwise, please hold." 0046 - rec, "All of our lines are still busy. Please hold, your call will be answered in the sequence it was received." 0048 - rec, "You have reached the Denver Department of Social Services. All of our operators are still busy. Please hold, and your call will be answered in the sequence it was received." 0049 - rec, "<buzzing noise> Thank you for calling the Denver Treasury Division. Our hours are 8 AM to 5 PM Monday through Friday. Our taxpayer service representatives are busy with customers. If you need assistance with state tax or any city other than Denver, please call those tax offices. Please hold, and your call will be answered by the next available person. Thank you for your patie-"
0050 - rec, "<buzzing noise>-for calling the property tax section of the Denver treasury division. Our hours are 8 AM to 5 PM Monday through Friday. Our taxpayer service representatives are busy with customers. Please hold, and your call will be answered by the next available person. If you need information regarding property value, please contact the assessment division at 640-3021." 0051 - rec, "Thank you for calling the special accounts unit of the city and county of Denver treasury division. All our lines are busy. Please hold, and your call will be answered as soon as the next taxpayer service representative is available. Please do not hang up. 0052 - rec, "All of our attendants are presently busy. Please stay on the line, so your call can be processed in the order it was received." 0053 - rec, "Thank you for calling the occupational health and safety clinic. All our lines are presently busy. Please hold, and your call will be answered in the order it was received." 0054 - rec, "You have reached the patient lines at Denver General Hospital. These lines are open for incoming calls from seven thirty AM to 10 o'clock PM. If you are calling a patient, please call back during those hours. Thank you for calling." 0055 - rec, "You have reached the Denver Department of Social Services. All of our operators are currently busy. Please hold, and your call will be answered in the order it was received. If you know the extension number of the person you wish to reach, please hang up and redial, putting 727 in front of the extension." 0056 - rec, "You have reached the teen clinic. If you have a life threatening emergency, call 911. If you need a medication refill, please have your bottle available. Please continue to hold. Someone will be with you as soon as possible. Thank you. <repeats in Spanish>"
0057 - rec, "You have reached The Dental Clinic. Our lines are busy. Please continue to hold, and someone will be with you as soon as possible. Your call is important to us. Thank you. <repeats in Spanish>"
0058 - rec, "You have reached Pediatrics. If you have a life-threaening emergency, call 911. Otherwise, please hold AND we will be with you as soon as possible. <repeats in Spanish>"
0059 - rec, "You have reached Sandos West Side. If you have a life-threatening emergency, hang up and call 911. Otherwise, please hold. <repeats in Spanish>"
0060 - rec, "Please hold. Your call will be answered in the order in which it was received. <repeats in Spanish>"
0061 - rec, "You have reached Adult Medication. If you have a life-threatening emergency, call 911. If you need a medication refill, please have your bottle available. Please hold. Someone will be with you as soon as possible. Thank you." <repeats in Spanish>"
0062 - rec, "You have reached Denver Cares. All lines are presently busy. If this is a medical emergency, please dial 911." 0063 - rec, "The number called is busy. A special ringing will tell you when the line is free. Please hang up now." 0064 - rec, "You have cancelled your request. Please hang up now." 0066 - rec, "Your call has been completed. However, the party you have called is not receiving calls at this time." 0068 - rec, "Your selective call forwarding and call forwarding features cannot be used at the same time." 0071 - rec, Thank you for calling the Denver Election Commission. Currently, there's a large volume of calls. If you live in the city and county of Denver, please stay on the line, and your call will be answered by the next available person. If you live in Arrapahoe(sp? ), Boulder, Adams, or Jefferson County, call that county clerk's office for assistance. Your call will be answered in the order it was received." 0072 - rec, "Sorry. We are experiencing a heavy volume of calls. Please continue to hold." 0073 - rec, "You have reached the Denver County Courts General Sessions Division. All of our lines are busy. Your call is very important to us, so please hold. we will assist you in the order it was received." 0074 - rec, "You have reached the Denver department of social services. All of our operators are still busy. Please hold, and it will be answered in the order it was received." 0075 - rec, "You have reached the eye clinic at Denver General Hospital. All lines are presently busy. Please hold, your call will be answered in the order it was received." 0076 - rec, "You have reached the kids care clinic at Denver General Hospital. All lines are presently busy. Please hold, your call will be answered in the order it was received." 0077 - rec, "I'm sorry. Due to a heavy volume of calls, all lines are still busy. Please hold, your call is important to us." 0078 - rec, "Thank you for calling the Denver Assessment division real estate information section. All of our lines are busy. Please hold, and your call will be answered in the order it was received. If you're calling to inquire about tax information, please call the treasury division on 640-3792." 0079 - rec, "You have reached the adult care clinic at Denver General Hospital. All lines are presently busy. Please hold, your call will be answered in the order it was received." 0080 - rec, "You have reached the orthopedic surgery clinit at Denver General Hospital. All lines are presently busy. Please hold, your call will be answered in the order it was received." 0081 - rec, "You have reached admissions and patient information at Denver General Hospital. All lines are presently busy. Please hold, your call will be answered in the order it was received." 0082 - rec, "You have reached the walk-in clinit at Denver General Hospital. All lines are presently busy. Please hold, your call will be answered in the order it was received." 0084 - rec, "You have reached the women's care clinic at Denver General Hospital. All lines are presently busy. Please hold, your call will be answered in the order it was received." 0085 - rec, "You have reached the ear, nose and throat clinic at Denver General Hospital. Please hold, your call will be answered in the order it was received." 0086 - rec, "You have reached the dental clinic at Denver General Hospital. All lines are presently busy. Please hold, your call will be answered in the order it was received." 0088 - Loud, broken echo test? 0090 - rec, "The number cannot be reached now. Please hang up and try again later." 0092 - rec, "This local call has changed to ten digits. It is not necessary to dial a one when calling this number. Please redial using area code 303." 0093 - rec, "You have reached 911. Do not hang up. An operator will be with you. We are on backup service and cannot trace your call. Please stay on the line." 0096 - rec, "You have reached the Jury Commissioner's office. Please hold, your call will be answered in the order it was received. Thank you." 0097 - rec, "You have reached the 911 emergency backup communications center. If you do not have a medial or fire emergency or require police response, please hang up, consult your local media for information that service has been restored." 406-293-0013 - This looks to be some sort of DISA for Frontier's customer service IVRs; TellMe has something very much like this running on AT&T's 5ESS toll tandems (866-283-5563 if you want to compare) - this is probably the same arrangement. Anyway, 000 on the Frontier one goes to a Y2K recording, probably on the AT&T network. As I was recently helping Mistman clearing out his late grandmother's estate I came across an old VCR tape of a partial KATU news broadcast that she had recorded around '91 or so. In the days before the World Wide Web killed such things off, KATU had an telephone-based opinion polling system in use around that time called "Telepoll", basically the idea is they would display a slide showing the big hot-button topic of the night (e.g. "Should strippers who are abducted by UFOs be forced into weight-loss programs") then another slide gave a list of numbers to call to register your choice. I think they had a bank of maybe 4 or 5 different numbers but I remember rarely seeing any beyond one number for "yes" and another for "no". Paul Linnman would then instruct the viewer to call the particular number then "when you hear the electronic beep" it means your vote has been counted. I do recall playing with the system as a teenager and it semeed to be up all day (so you could call a number at say noon and vote for nothing, basically) and the system didn't respond to DTMF. So that's one thing to consider. If you're scanning/janning around an exchange and hit a number that just beeps once and doesn't respond to anything, and isn't a miliwatt (I think the KATU tone was somewhere around 500 Hz or so) it's possible that you've hit a maybe forgotten-about TV/radio station polling system that's still accepting votes for whatever big controversy was hot the last time anybody thought to use it. Oh yeah, about that KATU thing: The numbers were sequential in one of the 503-73x exchanges. I think they were 1001-1005 or something. The exchange might have been 737. It's been years decades since I've seen it and the taped broadcast cut to an episode of "The Nest Generation" from KPTV just as the topic slide was about to display. Sorry I couldn't attach a photo, I have one but it doesn't want to upload from my phone at the moment. Maybe. My experience scanning has been that those things typically live on toll tandems for whatever reason (designed to take a huge burst of traffic, maybe?). You'll see in that MCI thread for example though, there's a "thanks for voting" recording stuck on a DEX. The 4ESS definitely has support built into it for this very thing; assuming the show is still a thing, American Idol uses it. 360-652-9958 - ACTS phone in a booth at a rest stop in Arlington, Washington. This phone really pulled the rug out from under my feet; if you flash, the switch will stop what it's doing, and put you on silence for...maybe forever. The DMS-10s I've used go to permanent signal when you do this, so when you combine that with the APMax in this office, well, it came as a huge surprise when I learned this is on a 5ESS. It's on some sort of weird linecard too; not the quintessential 5ESS card with the loud relays and weird frequency response. Oh, yeah, and if you try dialing a 710 number from the phone, it'll stay silent for a while, and drop you back to dialtone. Basically, it's like a switch wearing Groucho Marx glasses. Anyway, the phone rings. 204-277-8000-8003 - Recording, supes, "We are sorry. Because of equipment problems, all out of town calling is out of service at this time. MTS personnel are working to repair the problem. Please try your call later. This is a recording." 9959 - Weird noises. Broken trunk? 9955 - Ringout. Picks up when 9954 is offhook? 9952 - Weird noises. Broken trunk? 9936 - Line with nasty hum, 300 baud modem? I want to say that one (at the very least) is a "broken" recording. CBCAD or YCDNGT, something of the sort. There's a pattern to the noise, it repeats 3 times with brief pauses in between, and it dumps the line after the last repetition. For what it's worth, there was another DMS-10 (503-621) doing that when I first moved to Portland. About a few months later, it returned to giving normal announcements from a Cognitronics announcement machine of some kind. Anyway, so after a little bit of investigating, I think I've got a pretty good grasp on where Canadian exchanges like to keep their test numbers. 1147 - rec, "We are unable to complete your call as dialed. If you are dialing long distance, please dial the access digit 1 first. This is a recording"
1145 - rec, "We're sorry, your call cannot be completed as dialed. You must dial all seven digits to complete your call. Please hang up and t-"
1142 - rec, "911 service is not available in this community. Please dial the service you want directly, or call the operator for assistance." The rest of that particular exchange looked a little vacant. Then again though, this particular one is waaaaaaay out in the middle of nowhere - like, the CO doesn't even have an address; it just has coordinates. 0001 - rec, "The number cannot be reached now. Please hang up and try again later." 0023 - rec, "You have reached the NPA 564 test message." 0037 - Reorder via DMS? 0044 - Qwest IVR, "Sorry, your party could not be reached. Goodbye." 0045 - rec, "This local call now requires ten digits. It is not necessary to dial a one when calling this number. Please redial using the correct area code." 0050 - Qwest IVR, "Sorry, your party could not be reached. Goodbye." 0062 - rec, "Your call has been completed. However the party you are calling is not taking calls at this time." 0083 - rec, "The number cannot be reached now. Please hang up and try again later."